Sourpuss is a brand that I have been head over heels in love with for quite some time. They specialize in clothing that is anything but mainstream fashion. In addition to clothing, Sourpuss has some unique home and kitchen items for your alternative lifestyle. These houseware designs from Sourpuss are sure to stand out from the crowd and are anything but typical. These items in this gift guide are perfect for the foodie in your life. This post is a round up of my favorites that can all be found on Amazon. Warning: There will be some foul language in this Sourpuss Gift Guide so if that offends you go clutch your pearls someplace else. If you would like to do some shopping from this Sourpuss gift guide, simply click the images or the links that are provided. Let’s kick things off here with my favorite home & kitchen items from Sourpuss. They have a small line of tiki mugs available that are not your typical tiki mugs. They bring a much-welcome twist to theirs with these alternative designs. I have all four of these awesome tiki mugs in my collection and they are always a big hit with my guests. These mugs are perfect for serving up your next tropical drink. How cool are these alternative lifestyle tea towels by Sourpuss? Can you see the hearts and stars in my eyes? I absolutely love these towels with the vintage-inspired graphics and the potty mouth wording on them. Here is an adorable donut patterned apron and dish towel set by Sourpuss brand. Holy moly this set is freaking hot! Not sure about you but for me, I am all about death before decaf and I can’t possibly live without my morning cup of Joe! Sourpuss has a wide variety of coffee mugs available for you to sip your coffee out of. These mugs are perfect for the alternative lifestyle and they make a bold statement. The STFU Mug is hands down my favorite here. It is true… do not talk to me until I have that first cup of coffee running through my veins. Cozy up to a slice of pizza with this pepperoni skull pillow by Sourpuss. This is a super soft, hand-sewn pillow that measures 15″. Is your skin covered in ink? Show your tattoo pride off with this 9″ plate by Sourpuss. This plate is made of porcelain and it is both microwave and dishwasher-safe. Sourpuss has a unique and very clever line of enamel pins. These are fab for buttoning onto jackets, cardigans, and hats. These are anything but mainstream and are perfect for your alternative lifestyle! A great conversation piece! Want to creep and spook out your dinner guests? Hand over these arsenic and cyanideÂ salt and pepper shakers and let them pick their poison! 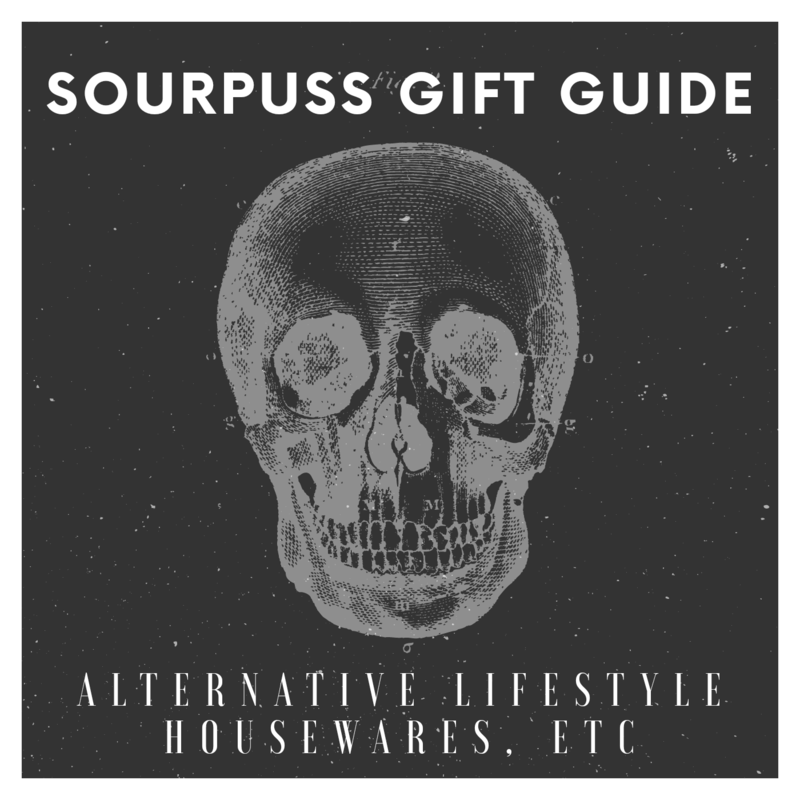 What is your favorite item from this alternative lifestyle Sourpuss gift guide? Leave me a comment and let me know. I would love to hear your fave! Find out more about Sourpuss! THIS POST CONTAINS AFFILIATE LINKS. I DO RECEIVE A SMALL COMMISSION IF ITEMS ARE PURCHASED THROUGH THESE LINKS (no extra cost to you). ALL OPINIONS STATED HERE ARE MY OWN. This entry was posted in Shopping Guide and tagged alternative lifestyle, amazon, apron, bride of frankenstein, burger, cat, coffee, coffee mug, coffee tumbler, dish towel, donut, enamel pin, frankenstein, gift guide, gifts, nacho, octopus, peas, pillow, pizza, salt and pepper shakers, shopping, shopping guide, skull, Sourpuss, tattoo, tea towel, tiki mug, tropical drink. Bookmark the permalink.